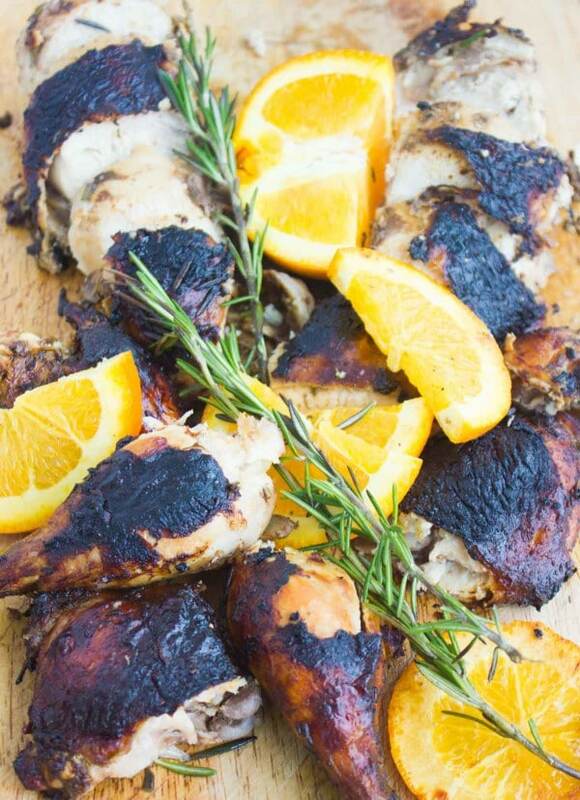 This rosemary balsamic bbq whole chicken recipe is super moist, char grilled, infused with the sweetness of orange and balsamic vinegar, and an over load of garlic, rosemary and olive oil. 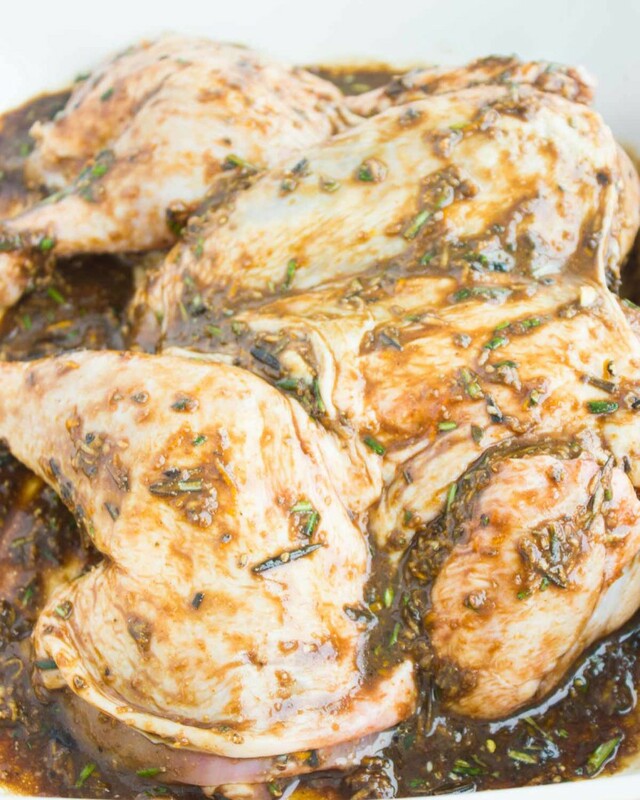 The marinade comes together in a minute and the whole chicken cooks in just 40 minutes! While you can still bbq, make this perfect chicken meets bbq fiesta.. 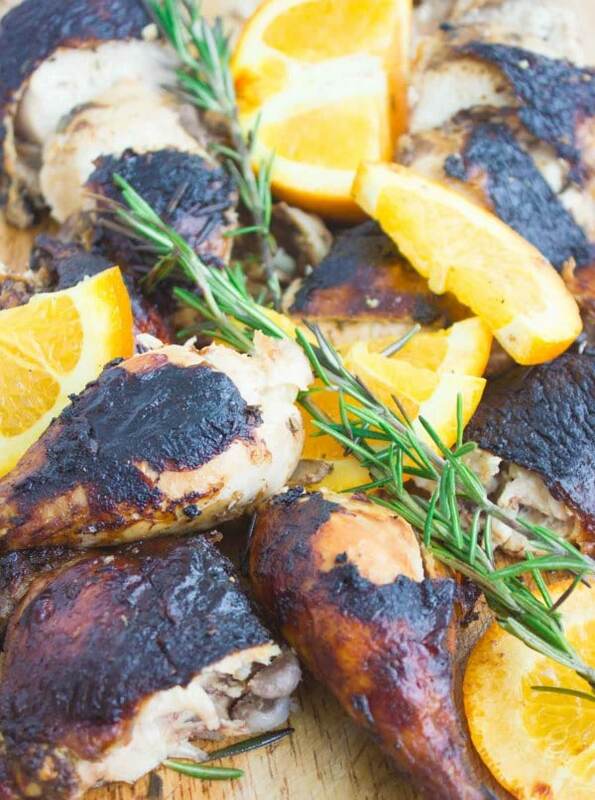 The first thing anyone hears when I say I’m making this rosemary balsamic bbq whole chicken is: can you bbq a whole chicken!?! Well yes, double yes, triple yes because of a magic trick called butterflying the chicken! I wrote much about this in this lovely easiest garlic herb roast chicken recipe and there’s step by step photos to make life easier for everyone! It’s such a simple trick that changes the way you cook your whole chicken or turkey! It slashes cooking time in half and makes any marinade infuse more and better into your poultry, and the best things is—it’s a super simple technique that you can do in 2 minutes, or ask your butcher to do for you! 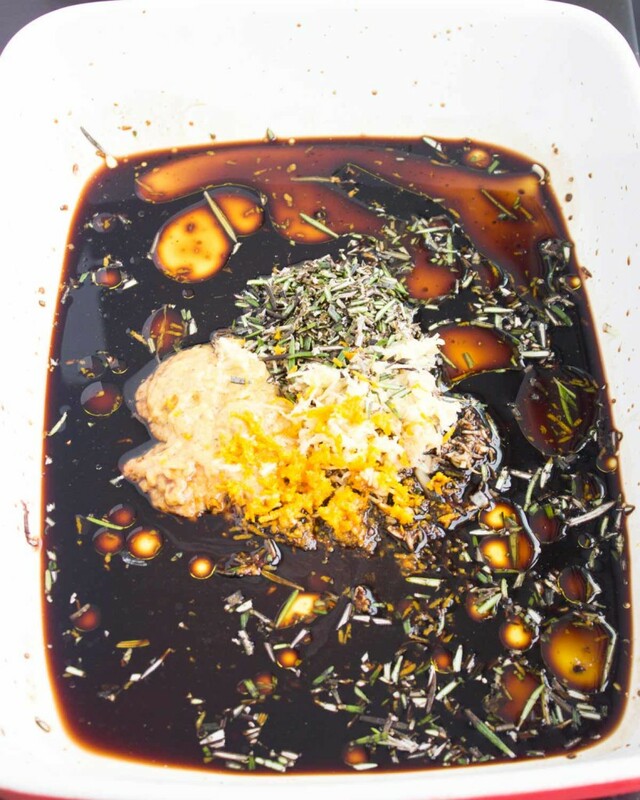 So I will talk really quickly about the marinade, it’s one of my favorites—it has balsamic vinegar, lots of garlic, mustard, orange juice and orange zest, plenty of fresh rosemary (or use dried) and some olive oil. The secret tip here is, you can use store bought balsamic vinaigrette of your choice and just load it up with garlic, mustard and rosemary for an even stronger bolder marinade. Or this fabulous basil balsamic vinaigrette from this pecan blackberry roast veggie power salad, and again load it up with the rest of the flavors. If you’re not a rosemary person, feel free to substitute that with oregano or your favorite herb and feel free to add in some onions or whatever your mood tells you that day! The more the chicken marinates the better of course, but I find that half an hour is good enough if you’re rushed. 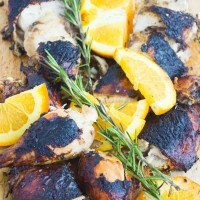 The rosemary balsamic bbq chicken is then placed on the grill (back side down), and covered for 15 minutes, then flipped and covered for another 15 minutes, and flipped again, covered for about 10-15 minutes (depending on the size of your chicken). Now if you’re leaving this to the grill master, aka my husband, then you’ll end up with this pretty strong char on your chicken…which the chef, aka me, doesn’t always approve of..but then again the chef doesn’t complain because she enjoys watching the bbq master do his thing while she catches a break from grilling and chats with her friends! Preheat the grill and keep the lid shut. Butterfly the whole chicken (photos in this easy garlic herb roast chicken)-start by placing it standing on your cutting board with the cavity down. Then using a sharp knife run it across the sides of the back bone and remove it entirely. Then place the chicken on the board with the cut side down and using the palm of your hand and the knife, smash the breast of the chicken to gently crack the bone and flatten the whole chicken. Take a small paring knife and make a small slit in the breast bone and the thigh bone junction. In a wide shallow bowl or baking plate prepare the marinade by mixing the balsamic, garlic, mustard, rosemary and olive oil. Whisk well and season with salt and pepper. Coat the chicken in the marinade making sure to go between the skin and flesh. It’s best if chicken marinades for at least half an hour. Place the chicken on the grill (back side down) and close the bbq lid for 15 minutes. Flip the chicken (breast side down) and close the bbq lid for another 15 minutes. Then flip the chicken one last time and close the lid on the bbq for an extra 10-15 minutes (depending on the size of your chicken). An instant meat thermometer should read 180 degrees in the thighs/drumstick part and 170 degrees for the breast. Remove the chicken from the grill and tent lightly with foil for about 5 minutes before cutting through to make sure it stays juicy. Dear Mahy. My husband (lately) is hating the way I cook chicke. 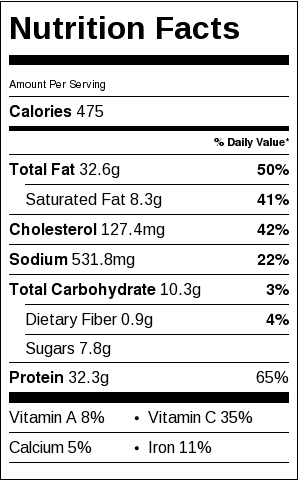 Today I baked the chicken instead of bbquing, using this recipe after marinating for 24 hrs and he loved and ate all. Thanks for this tasteful recipe. 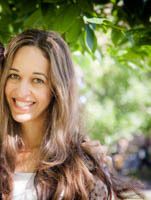 Thank you Reem, you made my day! So glad you (and husband) enjoyed this and with a 24 hour marinade I can imagine it was super flavorful! Oh my God these were just delicious! Out of this world, sweetness of the orange along with the baksamic vinegar was too good for words, unfortunately i couldnt bbq it but I roasted them in the oven and indulged! So great you liked this!! I often roast it too–we’ve just been lucky this year with a “warm” Fall so we’re taking advantage of the bbq! I love this recipe..my kids loved it..